George M. Slaysman, pastor of First Baptist York, Pennsylvania, and his congregation earlier in the year allowed the Duquesne Grays Pennsylvania regiment to use church buildings as barracks as the soldiers trained in preparation for the battlefield. This month, as their time for deployment draws nigh, the soldiers move to newly-constructed barracks nearby. Upon completion of their training, the soldiers seek to pay the church for their use of the facilities, but Slaysman refuses payment. In appreciation, the Grays’ soldiers gift the church with a Communion Table Bible. For his part, Slaysman remains ardent in his support of Union soldiers, and plays a prominent role in the building of a U. S. Army hospital in York. Later, in the summer of 1862, the Baptist pastor volunteers his services as the chaplain of the newly-created 130th Pennsylvania Regiment. Baptist ministers serving as army chaplains North and South in almost all instances (other than active soldiers who also assume chaplain responsibilities) refuse government pay, instead depending upon their own resources or funding from Baptist congregations and/or denominational bodies. Particularly in the South, the refusal to accept government pay for army chaplain services is one of few ways that Baptists, caught up in the fervor of Christian nationalism, remain faithful to their heritage of church state separation. Following his service, which lasts about a year, Slaysman returns to civilian ministry and pastors various churches in Pennsylvania before returning to York in 1865, where he remains for four years. As are many other Baptist ministers, Slaysman is bivocational. The entrepreneurial pastor supports himself financially by practicing dentistry, selling books, and teaching music. 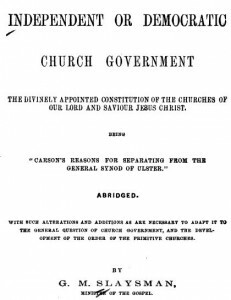 In 1868 he publishes a book entitled, Independent or Democratic Church Government. In addition, Slaysman, active in the American Baptist Missionary Union prior to the war, in the post-war years becomes involved in York’s temperance movement. He also assists in the creation of the Historical Society of York County, Pennsylvania. The year 1870 finds Slaysman pastoring in Pottstown, where he remains for two years, baptizing some 128 during this time. George Slaysman, born in 1822, dies in 1904. His widow Mary survives him by 45 years, dying at the age of 80 in 1949. George and Mary are buried in Shirleysburg.